World Cup Discussion: Italy to Win? 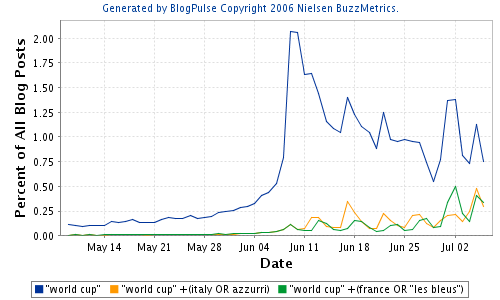 Here's how I read the following graph: the blogosphere was more surprised to see France getting through to the final than Italy. Therefore, there is a higher expectation for Italy to win. 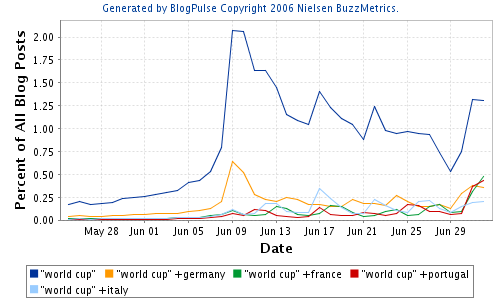 It is interesting to see how discussion of the World Cup bounces back as we approach the semi-finals. Are we going to see posting volume on the day of the final stretch above the initial peak? Update: Olivier over at insights 2.0 give some much needed non-English perspective. The World Cup started on the 9th of June. If we take discussion found in online content (blogs, boards and usenet), we can determine the increase in discussion about a country/team comparing the time period before the competition started with that from the start to now. The graphic below maps these changes. One can clearly see Ghana has acheived the highest increase (4.4 times its pre-start volume). England is the country with the lowest increase (1.5 times). The data compares the time period from May 1st 2006 to June 8th 2006 with June 9th 2006 to June 26th 2006. 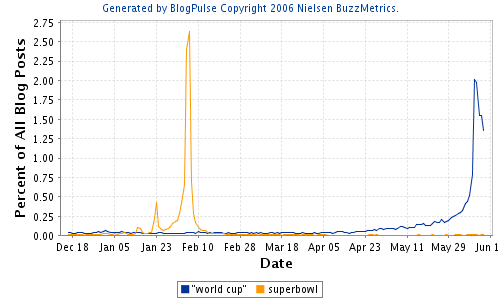 The US Superbowl (the final of the national American Football competition) attracts approximately 90MM viewers. This number indicates the number of pairs of eyeballs watching the match. If we count these viewing events (number of people watching a match), then the number for the entire World Cup is somewhere around 30 billion (yes, more people than on the planet). It seems like there is an opportunity to do something here. For example, we believe that there is a relationship between blog mentions and movie sales (movie sales being an estimate of audience). What can the TV viewership (let's pretend it is an exact science) tell us about counting blog postings (which we might assume is currently open, especially when considering the international scene). The simplest model would be to assume that each viewing event (v) caused a blogging event (b) with probability p. We could get more sophisticated by estimating the probability that the viewer was a blogger, and then the probability that the blogger would write a post. 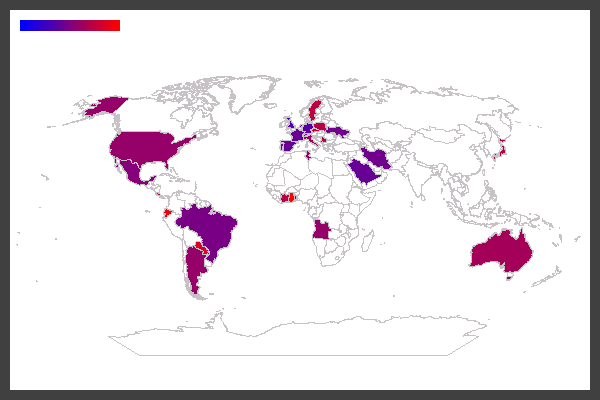 Taking it to the next stage, we could estimate the probabilities conditioned on the country, age, etc. of the blogger. Well - it seems like there is something in there. I'm not going to do this on a Wednesday evening, however, so if some kind soul would carry on, I'd be most obliged.